I only wish that this disc had emerged as part of Macque’s 400th anniversary in 2014 as I was searching about for examples of his works at that time. It is fair to say, however, that he represents a type of second-division madrigalist who was deservedly well known during his lifetime but whose somewhat disparate output, slightly lacking individually, has now been largely forgotten. Even so, these pieces are worth getting to know. The six examples of his keyboard music represents a curiosity, which might make you search it out. 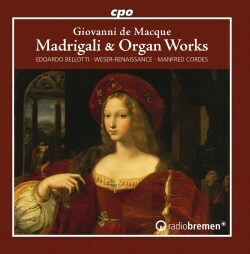 The chosen vocal works were published in Venice in 1613 as Macque’s Sixth book of madrigals for five voices. The texts are fascinatingly contrasted although all are anonymous. They evolve around the usual suspects, Phyllis, Clori and Diana for example, all Greek myth. Then there are lighter texts inspired by nature, especially birds. Standard stuff, you might say, but these texts are more deeply penetrative and thought-provoking than one often finds at that time. I tuoi capelli, a Filli is particularly moving. The last verse begins ‘O Phyllis, I lament your wanton destruction / And the world of my sorrows revives. / Ah, please remember our beautiful past’ (translation by J. Bradford Robinson). Actually, this madrigal divided into four sections is the longest of the set at almost nine minutes, but Macque never wallows in pity and dismal humours. The emotions are tempered but deeply affecting. Macque is not a million miles from the language of Carlo Gesualdo. This is especially noticeable in the daring harmonies of several of the keyboard works. It seems that Macque knew and worked for the father of the famous Prince of Venosa from 1585 when he was a young man. The great Gesualdo was at that time just about twenty. It would be wonderful to know how they might have influenced each other. Macque uses in many works the sort of chromaticisms that Gesualdo was prone to. This is certainly the case in the keyboard works heard here, especially the brilliantly played Capriccio sopra re fa mi sol with its “extravagant treatment of dissonances”. The notes by organist Edouardo Bellotti continue concerning Consonanze Stravaganti that it “has bold harmonies…with enharmonic equivalents and abrupt modulations” but the madrigals are often haunted by as sense of sorrowful lamenting with “descending lines with dissonances” (Manfred Cordes in his essay on the madrigals). A good example is the moving La mio doglia s’avanza (My torments come closer / The more my hope recedes”). The last track, a sacred work Deh se pietosa sei, seems to have written as early as 1588 when Macque was in contact with Carlo Gesualdo. Ironically, it is entirely conventional and has none of the harmonic extravagancies discussed above. The problem is for me that, although there are some very sensitive moments, Manfred Cordes does not consistently bring out that much characterisation of the text. I find myself wondering what an Italian group like ‘La Venxiana’ would have made of this music. After all, their recordings of Gesualdo were so very well received when they emerged. Take for example Macque’s madrigal Figgio la nott’a la seguian. This contains much word painting “Night has fled, the stars have followed her/into the womb of the dark nether vault” – a fascinating translation, but later “And all the birds in the surrounding fields burst the silence of the new day”. Surely the mood should clearly change, vocal colours added or even tempo adjusted. But no, the performance comes across in the same mood and atmosphere as, say, Tu ti lagn’al mio pianto (You complain of my weeping). So, whilst the singers have exquisite voices which blend so very well, set against the subtle and tasteful harp support, a deeper communication and a clearer understanding of the poems seems to me to be lost in so many cases. The recording is ideal, with space yet with clarity. It was made in the typically spacious German brick church of St.Mauricius and St.Victor in Bassum in Lower Saxony. The accompanying essays by Cordes and organist Bellotti are very helpful and useful but discuss the pieces in a different order from that which is recorded. All texts are provided and well translated and there is a delightful cover of a lovely young woman as painted by the great Giulio Romano (d. 1546).